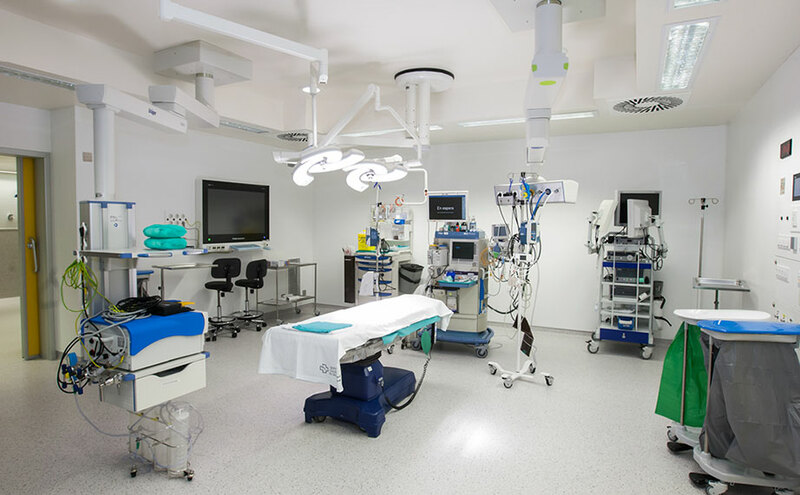 The CASASOLO Arquitectos studio was in charge of creating this huge project which, particularly on the 3rd floor (the new block of operating rooms), used the compact mineral from PORCELANOSA Group, KRION®. CASASOLO Arquitectos was founded in 2008 by architects Francesc Pernas, Bernat Gato and Roger Pernas, with the design and construction of healthcare buildings as their main sphere of operations. For this hospital, they have had the invaluable support of architect Cristina Fernández. The experience acquired in this kind of construction has led them to become a national point of reference and allowed them to undertake other projects in healthcare spaces such as research centres, laboratories, senior citizens’ centres, health centres, etc. with guaranteed quality. We can find the compact mineral from PORCELANOSA Group, KRION®, on the vertical coverings, 3 emergency operating rooms and 15 general operating rooms on the 3rd floor, the anti-splash washbasins of the operating rooms, corridor coverings and washbasins, and countless other places for which KRION® is an ideal material, thanks to its additive-free anti-bacterial properties, unnoticeable joints, easy cleaning, resistance to chemical attacks, and durability, etc. We would like to congratulate and also thank all companies involved in this project, who have trusted in the compact mineral from PORCELANOSA Group, KRION®. THANK YOU!! !